Mauricio Novoa is a designer and academic with 30 years of professional experience in a broad range of fields; from product to industrial, architecture, advertising, communications and marketing (2D, 3D and 4D time based, events and moving image). He draws on his professional experience with special interest on new emerging technologies and their development including their influence on society and culture, design and designers agency on social and cultural change, design thinking and innovation, design for the other 90%, human environments, cognition, user centered design, experience design and sustainability. 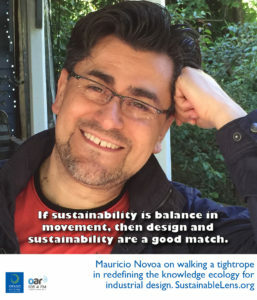 Mauricio is a lecturer in industrial design at the University of Western Sydney University, and is completing his PhD focussed on redefining the knowledge ecology for industrial design. Sam: I’m with Mauricio Novoa from the Western University of Sydney. He’s an academic there. He’s an industrial designer with a long history of industrial design across the globe for various large companies. He’s teaching design, focusing on emerging technologies and lots of social aspects to that design for the other 90%, including influence on society and cultural change, human environment, sustainability. …and he’s doing his PhD. Sam: Thank you for joining me. Mauricio: Thanks to you for having me. Sam: Where did you grow up? Mauricio: I grew up in Chile, in beautiful South America, in the capital of Santiago. Mauricio: That is a good question. I don’t remember. I’m not the typical guy that says I want to be an astronaut or anything like that, but I came from a very political family so probably I wanted to be a revolutionary. I was a small, perhaps a small kind of opinionated kid at the time. When I grew up, there were a lot of political issues in my country, so it was just natural to be interested in politics and social issues. Sam: What did you do through high school? What was your focus? Mauricio: My focus in high school was quite a lot directed into what is called now creative industries. In fact, I was born into a family that was socially motivated, but also was in relationship with craftsmanship. My father was one of the finest fine furniture makers and restorers in my country. My brother, an architect, and the family were academics. Some relatives mathematicians, some musicians. Either because of luck or just as a curse, I was born into humanities and arts. Sam: But you didn’t follow your father into furniture-making? Mauricio: Yeah, that was an interesting thing. Family pressures in Latin America are such that ideally they try to push into the real professions like law, medicine, architecture, and engineering. In my case, I wanted to become a sociologist. At the time that I did my HSC equivalent in Australia, the person that was at the top, closed down the sociology faculty because it was dangerous for deficient dictatorship. I had to decide on the next best bid, and I went into architecture fine arts, visual arts. Because of a matter life, I ended up working a lot in design. That became my way of doing things. In a way, I’m still connected to craftsmanship, but the modern way of doing craftsmanship. Sam: Did you manage to combine that social motivation and your design in your undergrad degree? Mauricio: I went to a school that was the Pontificial Catholic university in Santiago. Basically, that university is very much based on Bauhaus thinking. The idea of the craftsman person making social change was very important, coming from those times of pre-wars in Germany. Also, it was a very socially motivated area because in that time of the Bauhaus, it was natural for architects and designers to be together with philosophers and socially driven intellectuals. Over the years, that was [transplanted] into Chile. Chile’s a very political thing. When I grew up, you spoke either about politics, religion, or soccer. It’s a strange mix. In the mix, you put a little bit of dancing. It has to be like that. I’m stereotyping a little bit, but looking backwards in time, it was an issue of spontaneity. An issue of trying to fix things. Yes, my undergrad degree, I was socially motivated quite a lot. In fact, with then my university sweetheart that became my wife, we helped out orphanages with a group of friends, even. I was not the main founder, but we collaborated in the founding of an orphanage back in Chile. At a very young age, we took responsibility on about 30 or 35 children that were very destitute. Sam: A politically motivated or socially motivated young graduate with … Were you calling it design by then, or design schools? Mauricio: Design was very young in Chile at the time. I would translate it to fine arts, visual arts. There was in the universities a school of design that was part of the faculty of architecture design and art. But as a typical Bauhaus thing, you decided where to go. Because I was already working in industry for a few years, and I grew up in the business so to speak, I felt that I was going to be a little bit wasting my time if I went to study design per se. I was already working on it. The issue of becoming a designer became a matter of trying to make things useful, not just artistic. I think that was the shift concerning a lot of changes at the time because art sometimes tends to be very elitist. Nowadays, you see that many times art serves an art market, but doesn’t serve changing society in many places. Design became the better way of making things happen. Sam: You were already working in industry. That continued? Mauricio: Yeah. I was like a young guy, age 18, that I was already working in some architecture projects. Then I went into design and advertising. Somehow, I had a head start in comparison with my classmates in a sense. I was still young, but I was older in the way of seeing things in the discipline. Sam: Your bio says that you’ve got experience across product, industrial, architecture, advertising, communication, and across a whole pile of fields and across a whole pile of countries, and in a whole range of different things from electronics, construction, scientific. How do you hold all that together? What’s the common thread in that? Mauricio: That’s a good question. One of the best things that I can say is that as a designer, and I’m happy to be in this age because of in advertising, design and communications before, people thought in clients and users as consumers. Because of my upbringing, it has always been the opposite. The issue that you are the service of a user who’s a master of his or her own universe. You need to be very participatory. Designers through ages, they have been elevated, not trying to be artistic, but being very design-centered. When you are talking about social innovation, it’s about how to actually contextualise a problem. To answer your question, yes, I have been through different areas. But the important thing as a designer is not necessarily the one who knows more about science or more about engineering or more about sociology or ethnography. But a good designer is a good glue between different participants, and brings creativity into a problem because of can see things in a non-linear way. That’s why I’m saying I’m very happy to live in this age because this age is about the non-linear planet. It’s physical and digital. It’s multi-dimensional in different ways. Multi-mobile. Because I’ve been improving my own profession from project to project, I can come to a project and be quite humble to say I know zero about the expertise of my client or the user. But I know how to listen, and I’ve got methodology and techniques to actually see things in a way that sometimes others may not see it because they are too close to the problem. Sam: You can have a free hit. Pick a couple of highlights. Mauricio: Highlights in my life? Been lucky enough to be in a family that was visually related. Seeing things in three dimensions, in volumetric ways is important nowadays. Highlights in my life, obviously meeting my wife. She changed me a little bit from the guy who actually wanted to do a revolution to be smarter about it. Sam: Do you still want to do a revolution? Mauricio: Of course. If you are a designer, you should. But there is a big difference between disruptive innovation and incremental innovation. You need to be strategic about when is the proper time to do one or the other. The other highlight is that when I mentioned to you that I couldn’t get into sociology, now I’m doing a PhD in institute for cultural studies, which is called the Institute for Culture and Society in my university. Somehow, life is coming in circles. My interest is about re-defining the knowledge ecology for industrial design. I’m passionate about it because industrial design in itself has good things and not good things. The first question would be how can you be talking about industrial design in a post-industrial society? Some people call it post-post-industrial. I think it’s a good topic to talk about because still industrialization is a way of saving seven billion people that we’re going to become at some point, or we are. We cannot actually just do the old one-off thing. If we do it, we need to do production through customised means. I’m excited about living in this era that we have gone through 40 years of globalisation, and now we have to discover how to fix those 40 years. I’m sad about the sustainability problems, but every problem for a designer becomes an opportunity. It’s a very exciting age to live in. Sam: Industrial design has supported massive growth of industry and consumption that the world has never seen before in the last, well over the last 200 years, but in particular the consumption has gotten crazy in the last 50 or so years. Is industrial design to blame for that? Mauricio: To a point, yes, to be honest. There are some statistics, maybe they are a little bit old at the moment, that say that 99% of all the products that come out every year, they end up in the rubbish bin before six months. That is a result of somehow industrial design and industrial manufacturing involved in that. Yeah, to be quite honest, yes industrial design is in a situation that they need to wake up itself as a discipline. They are already doing that. There are some people that are already doing that. I’m not the first one. We need to start thinking responsibly about what we’re doing. Sam: From an industrial designer’s perspective, is planned obsolescence a thing? Mauricio: Yes. But I would say the idea of obsolescence, from my point of view, is still too attached to 1940s, after second War, American push for consumerism. There are people who are leaders in the field, not just in architecture and design, but also in culture that actually talk about the issue of evolutionary thinking and in itself obsolescence. How do you actually create a cradle-to-cradle system, so whatever you use today, you can get out of that not just one lifetime or life cycle, but quite a few of them. The idea of good being, that life cycle keeps repeating forever. Obviously, it’s impossible because we are in a physical planet, but the idea of use and reuse and recycling and all the other factors that are important for sustainability are in there. Sam: I had a colleague once who declared a few years ago that he was only going to buy things that would outlast him. Not in terms of food, obviously, but in terms of shoes and bags and whatever. Is it doable? Mauricio: Not always. Not always. But that is an interesting idea to follow. I’ll give you another example. Yes, for example, if you take packaging. Packaging is one of the most wasteful manufacturing outcomes. Many times, we spend more time in packaging than what goes inside. The packaging goes into the rubbish bin at the end of eating or doing something. If you think in packaging that could outlast you … If for example, you compost it or you change it in different ways, I think it’s not about outlasting you when one issue, one object is about maybe living system that can re-generate itself. In that way, even us, we can become compost and be useful for something else at some point. Sam: In terms of that social driver that you started with, does that come through in the work that you’re doing, and that you’re teaching students? Mauricio: Yes. Actually, yes. We have done projects in the past that are related to social innovation. But looking at the new definition or knowledge ecology for industrial design, what I have done for example is work internationally with for example, universities in Chile in projects related to social innovation. The outcome would be in people who are disadvantaged, for example, but also used in new technology. There is a big, big shift in third world countries that are no longer called third world countries. For example, Chile’s considered an emerging economy. Actually, you have knowledge and technology that they are transferring very quickly, and they are leap-frogging technology. While in Australia, New Zealand, or in United States we have invested in assets that become dated very quickly because of technology, countries like Chile or India or other countries, they just see the latest and they jump in straight away. Somehow, we’re going to see in the future a little bit of disadvantage, even in first world countries. I’m excited about that issue that is a social issue as well. To give you an example, how can it be that some of the poorest areas in United States are just nearby Silicon Valley? People in Silicon Valley have an easier communication with people in Netherlands than down the road or in the next town or suburb? We are going to see social divisions or social differentiation in a way that we have not seen it before. Before, we said, “This country’s poor. This country’s rich.” In reality, what we are developing with globalisation is not just differentiation between countries, but within countries. We may end up with many different nations so to speak, just going from one suburb to the next. The social edge, I think, is expanding in my case. At the beginning was an issue of helping marginal communities. I helped a lot, also, when I was young in what it would be like the Chilean favelas marginal areas. Helping them, for example, teaching them what now is called entrepreneurship, how to start a business. Instead of stealing because they are hungry, they can develop their own small business and build a community out of it. Now, you need to use the same principles through teaching to empower people to be self-starters because there is not a safe job anymore. Those same skills that I used to teach back in Chile in the early ’80s may become quite handy, even in first world nations like in Australia nowadays. Sam: Do you have a black list, a line that you won’t cross in terms of the clients that you’d work with or the products you won’t work on? Mauricio: Yes, actually. Things that are not ethical, and things that actually exploit people. I’m very, very strong over that. When you grew up in a situation that you are marked because you are a free thinker and you dare ask a question, that actually makes you really strong about defending all this even if you see injustice. Even if you don’t like a person just because … Is an issue of injustice. I’m very quick in championing that. Sam: Would you expect students or graduates to be able to do that? Mauricio: Ideally, yes, but those principles are principles that need to be contextualised and culturally based. I think we are living in an age, hopefully, the end of consumerism. Quite likely not. Where I have had students that actually say, “I don’t care what is happening in other country. If I see something that costs me $2, and I can get a Gucci lookalike or Louis Vuitton lookalike handbag, I’ll buy it. It doesn’t matter if it’s exploiting people somewhere else.” Or, for example, some brands that I prefer not to mention actually have made money at the expense of exploiting people. Yes, I will not wear that. Sam: You’re not going to go as far as to tell the students where that line is, but you would expect them to be aware of their own life? Mauricio: I welcome much debate as a lecturer. I think a good designer and lecturer should actually instil in people the capacity to think by themselves. Because of that premise, I cannot become a dictator and tell them what to think. But my job is to teach them how to think, and hopefully by teaching them how to think, they will realise the value of what is good or not. I have had some people, for example … Now, in Australia, there is a sense of wrong nationalism that for example discriminate by race. I’ve been in classes that suddenly they change into debates about races taking quite a lot of dominance in our country, in Australia, that you could describe as racist. My job is not to tell the person, “You’re wrong”, but my job is to actually teach them how they can find out that they are wrong. If you just impose your view on others, basically you’re not promoting critical thinking in a way. I’m paid to teach critical thinking, and the values come from there. Sam: You write about meaningful innovation. Whose meaning is it? Mauricio: That is an issue. Good question. Good design has got an impact, but that doesn’t mean that may be meaningful. When your friend says that he’s going to buy things that outlasts him or her … I don’t remember if it is male or female. He has got a sense of a planet Earth and being part of a whole universe in a specific sense. Nowadays, I think there’s sometimes wrong views about what meaning is. Yes, I admit for me, meaning would be improving culture, improving well-being, health, improving education. If you look from the economic point of view, that sometimes it’s taking us, impacting us how much money you make. My approach to design is that the impact, if you measure it by money, is a by-product of a good, meaningful outcome. A meaningful outcome, in that case, would be if you have influenced the user through your making to the level that that person goes to a better level, standard of living in a sense. If you can build a community in a sense that they have a better sense of belonging, for example. If they could actually go from, in the case of education, for a very transmission model of education which is the teacher knows, the students doesn’t, to one where you become involved in a Socratic and dialectic relationship. The teacher can learn as much from the student as the student can learn from the teacher, for example. That is a meaningful part that I am interested in. Sam: The counter-argument is that the designer’s work should be transparent. You shouldn’t see the influence of the designer on this thing. Mauricio: Okay. Transparent in which way? Sam: That you shouldn’t be leaving your personal feelings on that object or service or whatever it is. Mauricio: Yeah, for some people yes. There are two ways you can take that. The old tradition for design, and industrial design in this case but also communications, is that if a client came to you. Gave you a brief. You executed the brief. In that case, you were not different to a craftsman or woman that is given a task and produced it, like this piece of furniture. The only way to have creativity at that point would be whether the table is round or square, for example. That is all good. But in the day and age that we live today, we are not just operators, executors of a brief as someone else thought. I’m all for designers that actually are free thinkers. If you do that, you need to have your sense of ethics, sense of what is good or bad, being responsible, and that is where all these principles of equity and all the important principles come in. The idea of a designer being totally unattached or not showing evidence that they touched the design, I think it’s a little bit impossible. But it’s not good to be the other way where you see too much of the designer that you buy an object because it’s branded by the name of a designer. I think many designers do it and it’s a good way of branding and everything. But an object or an article of design, an artefact of design, should be bought or should be adopted because it actually helps the user. There are different levels of helping. One is perception. The other one is a status. The other one is actually functionality. Now, design has become very complicated. It’s not linear anymore like it was in the ’80s or ’90s when I was younger. That transpires a point that you are talking about. I will allow myself to find the concept of transparency in this case. It’s always the meaningful part. It will be transparent according to meaning, and if it is transparent according to meaning, the question would be whose meaning it is? I still vote for serving the user. Sam: Do you think that your twenty-something years of experience of this, do you think though that that’s got you to the position where you have the luxury of being able to think like that? But as a young graduate working in a design shop? Today I’m toothpaste and tomorrow I’m doing something else. Mauricio: In a sense, yes. You become more material about it. When you were talking and making a little bit of a joke about making a revolution, look at Cuba. They made humongous mistakes with their economy when they started, for example, just in agriculture they focused in sugar canes. They created a little bit of a sustainability problem in Cuba. I think we cannot deny the mistakes that we have made in the past. In a sense, I have grown in a profession through a profession and by a profession that is awakening to a reality in a sense. When I was younger, I was worried about putting bread on the table. But yes, I have to confess, I was a little bit different because of my, not necessarily socialist background, but social interest. I was a little bit lefty in that sense. I don’t see capital as the end of it. I think capital is a tool to get somewhere. Sam: Is design thinking inherently sustainable? Mauricio: Could you define that better? Sam: No, I was hoping you would. Mauricio: Design thinking is a process. If that is the case, it’s not about being sustainable or not, so I’ll ask you with an encrypted answer. I would like to think that design thinking has got a place. But what should be sustainable and we should start talking more about is about design competencies and design intelligence. We’re talking about business intelligence. We’re talking about emotional intelligence. We’re talking about different kind of intelligence. Why is that we and also governments and politicians are not talking about design and innovation intelligence? That is what should be sustainable. To me, design thinking is a tool to actually question, a tool for inquiry. Sam: If we were to articulate a design intelligence and a sustainable intelligence, how closely matched are those? Mauricio: It should be not close match, but close by. If you are talking about design as a process and design thinking as a method of inquiry, to some point I’m talking in an improvised way answering your question. Sustainability in itself is a balancing act. In there, you have things that could collaborate with each other, but at some point depending on how do you take sustainability. Sustainability may run the risk of becoming a little bit still, and design is not about being still. It’s about improving balance while in movement. In that case, if sustainability is balance in movement, then design and sustainability are a good match. When you talk about sustainability in business, for example, I have had the chance in my life to deal with business people. Sometimes their interpretation of sustainability is about at the end the bottom line. How to pay the bills. How to pay the receptionist at the front of the shop or the agency. Sustainability for them it becomes an accountability ledger. A cash flow issue of inputs and outputs. But design is not about input and output, at least not any more. It’s about balance in movement. It’s walking a tightrope in a sense. Sam: I’m told you’re an artist. Mauricio: That was a part of my beginning, yeah. In fact, in Chile I exhibited quite a lot. But in Chile, my generation is a generation some people have described as a little bit of a lost generation because many of us ended up outside of the country, so there was a brain drain. Now, yes I exhibited at Sydney Biennale which is very prestigious. Now there’s quite a few Biennales, but Sydney is one of the important ones. Still, in that case, it was about social change. It was about visual studies and culture. I learned when I was young the traditional skills of painting and drawing and of sculpture. But the work became a mix of different technologies, even digital technology at the time. Sam: How much is the move to digital changing design? Mauricio: Quite a lot. Just look at this building. We are at RMIT building and there are a lot of things in here that couldn’t be done a few years ago before computing. I was the director of the academic programme of industrial design until last year when I realised that I had to concentrate on my research. Administration is a good thing, but basically what I did was to re-write the curriculum for industrial design. We had a lot of discussions similar to the conversations that we have. You can see the difference between the old-fashioned designer and the new designer. In my case, I don’t deny. I’m not a born and bred academic guy. I come from industry, so to me it’s very practical. If the thing doesn’t work, it’s not design. If you are still telling me how beautiful it may be, then maybe that is good, but that is living in a special dream time. Designers should make their living out of not the proposal of the concept, but how it works. It’s a full, full process. One of the things that I’m involved in and developed for the new curriculum, is that we needed to go from craftsmanship and deciding what was the outcome of the design before you started, which is very 1980s. The new curriculum is about understanding that design is an animal that evolves. It’s a living animal in a sense. You start with the proper inquiry. That is where design thinking comes in, but also you apply ethnographic and anthropological techniques. Cognitive techniques as well, participatory action research for example is a very good one to carry out with users. After you listen, you learn from the user. You basically don’t know. You know the direction, but you don’t know the outcome until you get this agreement with the user. Only you can declare that it’s done when the user adopts it in a sense somehow, and it works. In the curriculum, the digital part that you’re commanding is very strong. For example, before I came in as a director, there was a lot of resistance to use of, for example, programming and developing, teaching students that the products, they need to become smarter. It doesn’t need to be necessarily smart. A bottle of water can be very smart by itself, but it’s passively smart. But it needs to be at the level that it can explain itself and you don’t need the manual for it. Many times, designers are very good at selling verbally and creating a manual, but not really delivering. That is the old way. The new way is about a thing that is very self-explanatory. The other part is to make it smart. If you look at the iPhone, it’s a good example. The iPhone is not really a phone. It’s the first mobile computer. The iPhone is not really a product. It’s a platform. When you start talking at that level, a good industrial designer needs to become capable to understand what happens inside the iPhone, which is the app, the programming, the coding. How, for example, you need to think and design at a different level, which is co-designing, co-creation, cooperation with users. Terms like co-designing and open source approaches to a design were not embedded in the curriculum before I came in. The digitalization of design is becoming quite important. It’s not just like in this beautiful building. You couldn’t actually do this because basically the façade of this building is the outcome of developing paramatric 3D CAD, for example. You couldn’t do this shape unless you were Gaudí in Barcelona that hewed it manually many years ago. But the other part is not just 3D CAD, parametric development. It’s also the idea that we are living more digitally. The students need to understand the user not physically only, but the digital identity of the user. That becomes very handy today. For example products, even if they are done in the old-fashioned way, they are no longer manufactured down the road. Basically, any product that you do today, one part, metal, will come from one country. The plastic from another. It’s quite likely if they are over-crowded in one place, they’ll outsource to two other different countries. I remember some time ago seeing some statistics that an iPhone inside was between 35 or 60 different providers from different countries. This idea of digitalization is very important for the students to learn. That is what I did with the Chileans as well. We were actually talking about the distributed design and manufacturing. Flexible design and manufacturing. Our students were working in Australia with the students in Chile, with people from Canada, people from Europe, and they were creating a product that ideally was going to be produced in China. That is the sort of digitalization, and that was not taught in the course until I came in. Sam: You said before that sustainability is about balancing movement. Is that your go-to definition of sustainability is someone backs you in a corner and asks you to define it? Mauricio: Ah, sustainability. Yes. I prefer to think that sustainability is dynamic. Yeah. The old definition of sustainability is yes, a balancing act, but I prefer the idea of the tightrope where the guy’s walking because I feel we are living in those times. We are walking out on a tightrope without a net, without a safety net. We need to be very careful about the steps that we take. Sam: We talked lots about destruction and change. My favourite definition of sustainability is now one of transformation, and we’ve got to get away from this “nothing is changed” because ironically, in order to not change, we have to change heaps. Sam: My favourite definition is restorative socio-ecological transformation. What do we need to do to design, indeed to co-create in a distributive way, all those words you just used, a sustainable, global transformation? Can we apply this thinking at a whole of society level? Mauricio: We should. We should. I guess there are still quite a few experiments that are trying to be scalable. If you look at, for example, what businesses call not “green movement” but they call it “blue movement”, which is when the green movement people decided that they cannot actually save the planet by themselves. They need to be at the same negotiating table with people who have been polluters for many years. With business, business has been in charge of polluting this planet for a long time. The part that I like about what you said about sustainability is a transformation in spirit. There are some leading thinkers that talk about transformation, but also another thing which is transcendence. I guess that should be one ideal of a good design that is meaningful to a level that transcends. In my understanding of English language, transformation is the act of moving from one shape to the next. But the idea of transcendence could take you from one domain to another, can take you from one piece of history to another, from one territory to another, from past to future. Maybe that is another thing that we could actually enter in the definition of sustainability. Like legacy to our children and grandchildren. That is transcendence. Sam: We’re writing a book of these conversations. We’re calling it Tomorrow’s Heroes, trying to work out what it is that people are doing so that we can bottle it and make more of it. How would you describe your superpower? What is it that you’re bringing to the good fight? Mauricio: Salsa. Salsa dancing. No actually, my wife is good at dancing. I’ve got two left feet, but I try. Superpower. I have never been asked that. Never. Sam: You can’t have laser eyes and you can’t have flying. I’m just narrowing it down for you. Mauricio: Yeah. I don’t know. I’m not about super powers. I’m about becoming more human. It’s very true. Mauricio: Myself? Yeah. I’m a little bit of a troublemaker, yes. If you can ask my colleagues, they can vouch for that. The issue of activism has evolved quite a lot. When I grew up, the activism was simpler in a way. I used to participate in rallies. It was a group of people against the tank shooting at you, or police people shooting three […] bullet in front of you in short distance. But now, if you’re going to be an activist, you need to become very sophisticated. I would like to think myself as a hacker, in a sense. But not at the level of … Some kind of hacking the system. I think we need to hack the system, in a sense, to make it better. Sam: More sophisticated, but perhaps less brave. Mauricio: No, not necessarily. My wife says I’m a bit foolish. Look, when you have grown up under a dictatorship, you are not necessarily afraid of death. The challenge is that you become more strategic, and that doesn’t mean that you are … With time and getting older, you become more strategic. I could say that when I was younger, I was more passionate. I still have the passion in there, but I’m becoming more strategic. The issue is that if you’re a good designer, you cannot lose that factor of being brave. It’s not about being bold. It’s about being brave, and not being afraid of change. That is a big risk if you are in education because of institutions by themselves tend to actually push into a certain shapes. One of the authors that I like from the ’80s was Foucault. He used to say that the institutions and education, for example, tend to build their own norms of good conduct. In one of his books, he was talking about an analysis of the prison system at the Panopticon. He said that at the end, the institutions doesn’t generate itself. It recycles itself. It’s the wrong sustainability factor, and in that process, anything coming in contact with it needs to follow the good conduct. That is a risk for a designer teacher because as soon as you need to have the good conduct with inverted commas, it somehow you stop yourself to do the design inquiry. Very important within design inquiry is the context where lies the inquiry. Because if the institutions as a matter of the religion, or political parties, or universities, they create their own domain, their own universe. Immediately, they come in context in themselves. But in theory, we’re teaching people for a context that is outside that institution. That is what Foucalt called the Panopticon. I don’t remember translating from Spanish or the Latin languages, the Panopticon syndrome maybe or something like that. Yeah, there is a risk in there: becoming institutionalised. Sam: Four more questions unless another one sneaks in. What motivates you? What gets you out of bed in the morning? Mauricio: Currently my research. Silly me, I still hope to change the world, even if it is just a matter of just thinking that if you say “I give up is not an option”, because if you give up, it means that you serve the system in these old terms, socialist terms. My wife says I am a very stubborn person. Maybe that is […]. Some friends have said replace that with being focused, which is the elegant way in English to call the same thing. But that’s it. I still believe that I can contribute something. Design is an ideal issue. I don’t mind if I go back into doing art. I still perceive art as a way of changing the planet, but at a cultural level. Design becomes an issue, especially industrial design, as a possibility of changing culture by things. For that, we have good examples. When ex-Bauhaus people wanted to re-establish Bauhaus in Germany, in the school that they initiated, they started tossing up two ideas to come up with a school of politics and social sciences, and they were going to start that. They decided to go for a school of design because that was a way of effectively changing and re-constructing Germany. I’m more for that issue. I’m a practical person. If we come up with good art, good product, it could be a good service or good system nowadays, and if we empower the user and the user becomes his or her own creator of meaningful outcomes, that would be excellent. That would be the ideal work of art, in a sense. Sam: How is it going? Mauricio: Well, I have deadlines so I am working for that. I’ve been working while I’m in here. Sam: Are these wife-imposed deadlines? Mauricio: University-imposed, it is convenient to finish. I would like to move with doing research based on that very soon. I just started a research with industry about new learning environments, which is very interesting. In Australia, there is a lot of money put into infrastructure to make things modern. Still, to me, the most changing moments have been talking to a mentor, and it has cost us the value of a cup of coffee. The issue is that we cannot avoid technology, but somehow we are investing in so much technologies that people don’t know what to do with it. That is an area of research that we need to investigate from an industrial point of view, but also from cultural aesthetics point of view because to me, the two are very much related. I think that would be my future. The other thing would be to try to enjoy life because as a PhD student, you don’t have much of a life. Sam: Yeah. If you could wave the magic wand and have a miracle occur by tomorrow morning, what would it be? Mauricio: You are making questions about magic wand or superhero. I’m so down to earth in that case. I like superhero movies, don’t get me wrong, and my says that I’m silly because later on I’m going for a few hours soaking with strange sounds like after watching Star Wars or something. Yeah. Sam: But of course, the catch of the superhero question is that they’re not really superpowers. They are really things that anybody could do. This question here has a similarly earthly version of it, which is what’s the smallest thing that you could do that would have the biggest possible impact? Mauricio: I would like to develop more design as a tool. But I would like to work more into social innovation, social change. As I was saying to you, I think that, for example, in Australia where I’m standing, the digital divide is becoming a certain level that some people are going to be left behind. There is one thing about knowledge and knowledge flow that is important. We need to work on that. I don’t perceive design and industrial design to clarify as an issue of a material product. For me, I go back into the essence of industrialization, which is pattern-making, serialisation. If that is the case … For example, one of my students came in from South Sudan years ago. He couldn’t understand about all this rapid prototyping and all that that we had in the university, but he told me one very interesting thing which was he started working well in industrial design when he actually realised that what he wanted to do was go back to South Sudan and start helping in the education system and re-educating the country after civil war and they won independence. He and I started developing open source blueprints. At that time, he couldn’t speak about digital open source because the country was in ruins, but the idea was to actually empower people in villages. You can with ideas about how to actually come up with artefacts. It was about teaching them the same language, Dinka, that is highly oral in tradition, and teaching them literacy and numeracy and all that because they needed to reconstruct the country. One thing that he taught me was to remind me about what I used to do in my younger years. Social innovation is something that I would like to actually help out, and if I had a magic wand, I would actually work on that, probably 100%. Sam: Lastly then, do you have any advice for our listeners? Mauricio: It’s good to be troublemaker, so don’t give up. Don’t forget about empathy. A lot of what we suffer today is because of lack of empathy. Mauricio: Yeah, thanks for you. I hope I didn’t speak too many silly things.